SO HOW DID A CHINESE CHILI SAUCE FIND HERSELF AT NEW YORK FASHION WEEK? China’s Hottest Woman Spicy Sauce and other Chinese brands are made their first debut in this promoting event ,2019 New York Fashion Week “China Day”. The show of New York Fashion Week from September 6th to September 12th has all ended. Now let us take a look at the novelties and surprises of Fashion Week. Not long ago, in the “China Day” promotion event of New York Fashion Week in Spring and Summer of 2019, “China’s hottest woman” boarded New York Fashion Week, and then “Laoganma（Chinese chili sauce）” sweater becomes popular. Chili sauce and clothing collide with different sparks. Netizens comment:” Powerful my chili sauce’.And some netizens also show their expectation, saying they are looking forward to buying one. Maybe some people will be confused, what is Laoganma? According to a 2017 Forbes estimate, Lao Gan Ma is worth more than 6.8 billion yuan (around one billion US dollars). Founded in 1997, the Lao Gan Ma Foodstuff company generated 3.72 billion yuan (around 544 million US dollars) in revenue in 2016, helping lift the economy in Guizhou Province, one of the poorest provinces in southwest China, according to Xinhua news agency. Beloved not only by Chinese locals, but also by non-Chinese consumers, the sauce once was sold on the luxury goods website Gilt for six US dollars a bottle in 2012, roughly eight times the price in China at that time. There’s also a fan group on Facebook with over 1,700 members. Most discussion is about how they consume the sauce everyday. 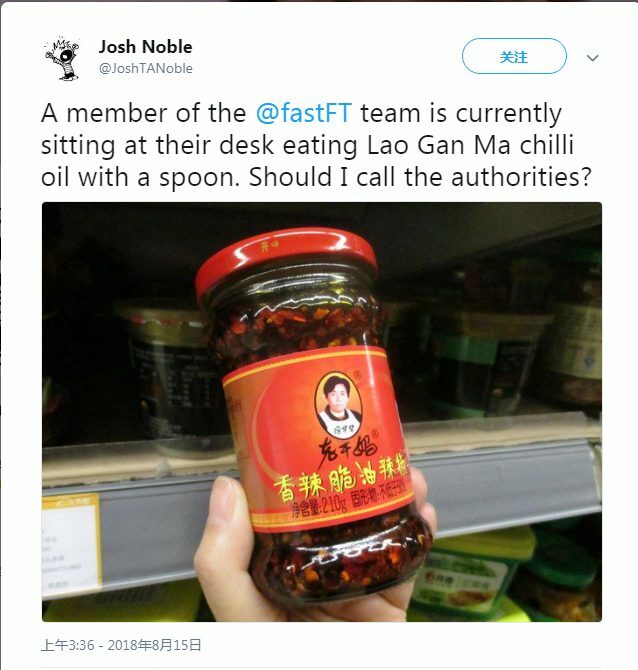 “A member of the @fastFT team is currently sitting at their desk eating Lao Gan Ma chili oil with a spoon. Should I call the authorities?” an editor at the Financial Times once said on Twitter. In addition to Laoganma, some famous Chinese old brand like Yunnan Baiyao，Shuangmei，Yiheyuan，Master Kong Hanyangquan made their first debut in this promoting event. In this fashion week, all these old brands are invited as the brand of the national trend flash shop,introducing new trends such as hooded sweaters and crew neck sweaters. But why are the chili sauce,toothpaste,mineral water related to fashion show? lol，the “Black hand behind the scenes” is Alibaba.The pop-up event is a strategy from Tmall, the Alibaba Group-owned e-commerce platform, to internationalize old Chinese brands and help Chinese designers gain popularity in the US. As the part of the company’s efforts to cultivate fashion talent and introduce creative culture in China, the Chinese online shopping giant kicked off the Spring/Summer 2019 New York Fashion Week by creating a “Tmall China Day” event. it’s great that you like our article,and we will update our fashion news asap. thanks for your appreciation. This is a good way to obtain connected with the targeted customers directly. Have you observe these ads on the world wide web before? Are you sure? This is the first article….